Music: Grace Potter and the Nocturnals, live at Wakarusa 2007. We have the live recording from the show, but you can access other live recordings from Grace (and many other bands) online at www.archive.org. real. I came across this recipe in Cooking Light and thought, well if I manage to get BJ to eat t ofu it better taste like garlic and be smothered in some sort of sauce. And – it worked! This is a great recipe if you don’t regularly eat tofu, but would like to try it. Don’t skimp on marinating or the red pepper sauce! The recipe takes some time, but well worth the work. 1. Cut tofu crosswise into 4 “steaks”. Place tofu slices on several layers of paper towels and let stand for about 30 minutes. You can press down to help properly drain the tofu. 2. Combine basil and next 8 ingredients (through garlic) in a plastic bag. Add tofu and marinate for about an hour, turning the bag occasionally. 3. Place flour, egg, and panko in separate shallow dishes. 4. 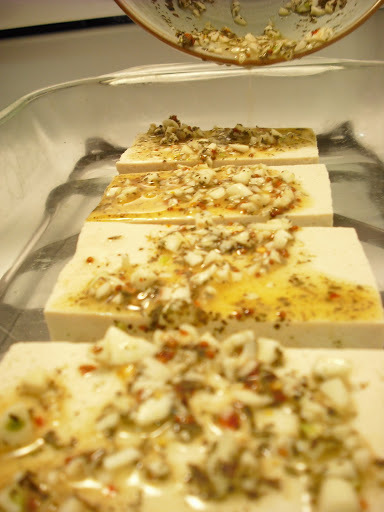 Remove tofu from marinade, reserving remaining marinade. Place tofu in flour, then egg, and lastly the panko. 5. Add EVOO to heated skillet and then add the tofu. Cook over medium heat for 4 minutes on each side or until browned. Remove tofu from pan, and keep warm. 6. Combine reserved marinade, walnuts, and bell peppers in a blender; process until smooth. Smother the tofu! !